for the past few days. I could still glean some of their meaning. fill their bags, move on. as a radio pips noon. every day for a lifetime. O’Mahony success is that she doesn’t naively enter into her project. In fact she purposefully changes one basic premise to her story: the letters of Margaret Butler aren’t in the possession of a (self-proclaimed) unrecognised writer, they are in a library. By setting them in a private, unauthorised and highly subjective setting, O’Mahony indulges in a scholarly sin. But better that than pretend that the formation of ‘lives’ hangs from cornices of truth. The poet’s genre-bending isn’t a lack of skill or a flagrant misapprehension, it is what brings the story to life. Dr. Sandeep Parmar is a leading American-British poet of her generation, and an expert on Mina Loy and Hope Mirlees. She makes her home between (in) London and New York. Her poetry appears in the new anthology from Bloodaxe, Voice Recognition: 21 Poets for the 21st Century. 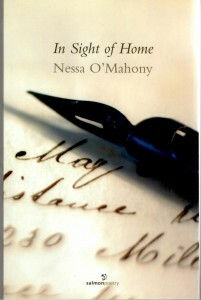 Review of “In Sight of Home” by Bill Greenwell on his Bill Posters blogNessa O’Mahony’s In Sight Of Home (like yesterday, from Salmon Poetry, an Irish press) breaks new ground, both in its choice of form and in its choice of genre. It will be filed, because of its publisher, under poetry, I guess, but it could equally find a home in fiction and biography. 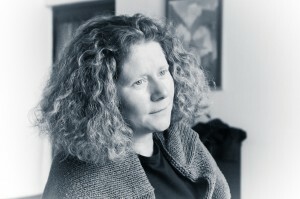 It’s a bold writer who composes a verse novel – Pushkin, Nabokov, Vikram Seth are the big names – or a verse biography (Ruth Padel has worked in this field). But this isn’t either of them. It mixes prose and poetry, and it freely mixes known fact, in the shape of a cache of letters written in the mid-nineteenth century by Margaret Butler, from Kilkenny, from Australia, with a fictional writer from the early twenty-first century, Fiona Sheehan, who is conducting her own journey, away from Dublin to North Wales, and who is working on the letters and turning them into her own poems. This is a really complicated echo-chamber – after all, we don’t know if Nessa O’Mahony is in any way, shape or form the alter ego of Sheehan; we don’t know (and O’Mahony isn’t telling) which of the Butler letters are made up, and which are original; we have to see if we can skip between the two journeys of (self-)exploration; and, just to keep the mixture rich, we are even given occasional notes by Sheehan about the defects in her poetry, poetry, of course, with which O’Mahony has provided her. And one can easily add to this sense that everything is a bit odd – after all, Ireland, 1850s, potato famine, isn’t it? O’Mahony is having none of this. She presents us with an altogether other kind of historical fact, that of fairly prosperous Irish families going to make a new life. Is it a bird, is it a plane, is it a verse novel? None of the above. What really works is the cutting between one genre and another, one time and another, and (best of all) the way that minor characters start working their way into the foreground. Chief amongst these is Lizzie Murphy, an almost extraneous figure at first, an orphan Irish girl who finds her way to Australia and into service with the Butler family, before marrying into it. Lizzie’s narrative seems so clearly distinct from Margaret’s and Fiona’s that it almost a shock to find, much later, that she is Fiona’s creation. In some ways, I think it is the situations more than the characters which grab the reader – the various culture shocks which are encountered, the way in which the main figures are separated from what they know, the way they become entangled with what was and what is, the way they become mixed up (so it is the structure, too, of In Sight Of Home that engages the reader, the ambition of asking the reader to consider on the one hand a rather hapless encounter between a fizzing present day media woman with a chaotic Welsh academic; and on the other hand, the doubly parallel universe – in time and space – of the women in Australia). This is a really challenging read. Narrative free verse is incredibly hard to do (arguably the hardest of all genres), and also the hardest to sustain. Mixing in the letters keeps the readers on their mettle. One moment you’re with Fiona’s aspiration to have a cat and feed it Whiskas, the next you’re in the outback, writing very proper letters to a cousin. Complexity can be a curse. Not here. You have to go back and read it a second time, a third. I thought it was astonishing.